Yesterday I talked about Narnia and hope. 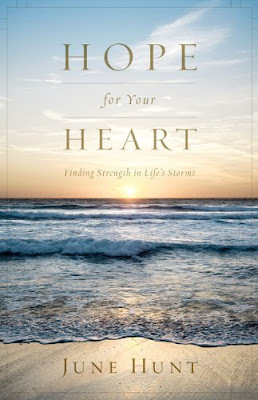 After writing up that post I finally got around to reading Hope for Your Heart : Finding Strength in Life's Storms which had been sitting on my shelf a little longer than I meant it to. I wasn't really sure what to expect of it so I can safely say it met all my expectations and then some. 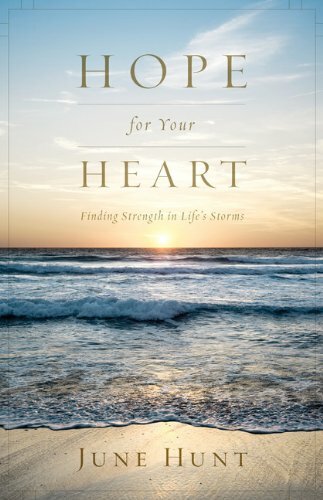 Mostly though, I walked away thinking that this book makes an excellent resource for the person looking for a bit of hope in life. And as humans we know that we cannot survive without hope. Yet sometimes we're threatened with the loss of it when our foundations are shaken and all of our knows suddenly become unknowns. not dependent on another person or a group of people, but rather it is dependent on the Lord alone. not wishful thinking, vague longing, or trying to fulfill a dream, but rather is assured, unchangeable and absolute. not determined by circumstances, events, or abilities, but rather is based on what is secured and promised. not merely a desire, but rather the delayed fulfillment of reality. not relying on the stars, luck, chance, or timing, but rather is predestined and settled in the heart and mind of God. not hoping your good will outweigh your bad to get you to heaven, but rather is the certainty of God that you will go to Heaven. It is a sure thing that you will experience grief and difficulties in life. Christian or no, life on the planet earth is not perfect and you will have to face a trial or two. As a Christian we understand that God does not preserve us from trials, but rather He promises to walk through them with us. He promises to sustain us during stressful times with friends and family, false accusations, the loss of a job, financial difficulties and even death. He will not leave us or forsake us (Heb. 13:5), so we know that we can hope in our future that is secure in Him. You might have heard of the "health and wealth" movement in Christianity which promotes and assumes the idea that God desires to give you "nothin' but the best" in life. While I would agree with the statement that God only has the best in mind for you, I would also argue that His best might not look the same as the best you have in mind for yourself. He doesn't mean for us all to live in mansions, be able to eat and afford organic foods, dress in the lastest style and fashion, drive fancy vehicles and always, always, always be in perfect health! In scriptures we read of Paul who was experiencing some sort of trial or physical ailment (no one knows exactly what it was and I think there's a reason it wasn't spelled out for us) that he continually prayed for God to remove from his life but that God chose to train Paul to trust in Him further. See 2 Corinthians 7:10-12 God's power is made perfect in our weaknesses. (Read 2 Corinthians 4 for additional encouragement in this vein.) Instead of avoiding the weakness or pretending and vowing that it doesn't exist, it is much better to glorify God in it, thanking Him for working in our lives in a faithful and loving way. Not only can He handle the truth of your thoughts and feelings, He can walk you through them. Try Him. Test and see if He is good. Probably a good thing for you to keep in mind when facing stressful situations or circumstances is that all of these bad and negative moments will also pass. Weeping may and will and does endure for a night (sometimes many, many nights!) but joy will come. Our circumstances change, but God does not. (Hebrews 13:8) He is the same always. He was the same yesterday as He will be tomorrow, as He always has been and always will be. That makes Him dependable. You can cry all your tears, beat the walls, pound the floors, yell out your frustrations to Him and He can handle it all with firm, supportive consistency. He is big enough to handle your problems. He can do it. And in Him we find our hope. Speaking to the children, he said, "You do not yet look so happy as I mean you to be." "There was a real railway accident," said Aslan softly. "Your father and mother and all of you are - as you used to call it in the Shadowlands - dead. The term is over; the holidays have begun. * The dream has ended; this is morning. And as he spoke he no longer looked to them like a lion; but the things that began to happen after that were so great and beautiful that I cannot write them. And for us this is the end of all stories, and we can most truly say that they all lived happily ever after. But for them it was only the beginning of the real story. All their life in this world and all their adventures in Narnia had only been the cover and the title page: now at last they were beginning Chapter One of the Great Story, which no one on earth had read, which goes on forever, in which every chapter is better than the one before." The best, in Christ Jesus, is always yet to come. So we press onward (Philippians 3:14) with hope, being sure of Him when nothing else looks quite so certain. He is. And that is what breeds hope. Thank you, Crossway Books, for providing a copy of this book for me to read. Excellent resource! Encouraging post...and oh boy to the Narnia tie in! Hunt's last two quotes -- "You can't shock Him" and focusing on Him, not circumstances -- are great! Love the Narnia tie-in, too! Considering the season I'm in, sounds like I really need to read this one.